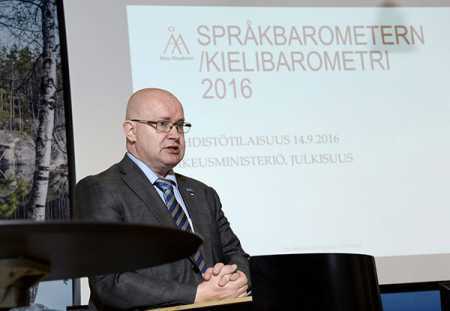 Justice and Labour Minister Jari Lindström spoke on the Language Barometer published by the Ministry and Åbo Akademi University on Wednesday. Photo – Lehtikuva. Finnish and Swedish language minority representatives feel that the atmosphere between the linguistic groups in their hometowns has deteriorated significantly since 2008, according to the Language Barometer published on Wednesday by the Ministry of Justice and Åbo Akademi University. Experiences with languages have increasingly changed from good to variable as reflected in the barometer. According to the barometer, Finnish speakers were more dissatisfied than Swedish speakers with the relationship between the two groups. Approximately two in five Swedish-speaking respondents felt that the attitude toward various language requirements had changed in a negative direction. In contrast, more than half of the Finnish speakers felt that the general attitude toward speaking other languages had changed for the better. The Language Barometer survey was sent to local representatives of minority language speakers in bilingual communities, and it received nearly 3,600 responses. The previous survey was conducted in 2012. Justice and Labour Minister Jari Lindström views the degradation of the language climate as a serious matter. It’s a matter of concern if someone is experiencing insecurities due to their own language, he told the publication ceremony of the barometer. “It is the responsibility of each of us that we all feel safe, regardless of language,” Lindström said. Of the Swedish-speaking respondents, nearly 45 per cent felt they had been harassed or discriminated against due to their language, while just over 20 per cent of Finnish speakers felt the same way. Swedish-speaking representatives felt that social services are more readily available in their own languages than state services. Finnish speakers, on the other hand, are more satisfied with the language of government services.